The Live adjust Z is a tool used to calibrate the distance between the tip of the nozzle and the print surface. An incorrect value can lead to various issues such as the first layer of your print not sticking properly to the print surface. You can also check out the video below which contains tons of useful information for new users, plus it also covers the first layer calibration. Make sure that the print surface (heatbed) is clean. You can find information on how to clean it in PEI print surface preparation. Also, don't forget to complete the XYZ calibration before moving onto the First layer calibration. Having a bright light pointed at the heatbed when doing the calibration will help you to easily spot the layer height. Please be very careful while lowering the Live Z value. If lowered too much, the nozzle can damage the steel sheet. This issue is not covered by the warranty. 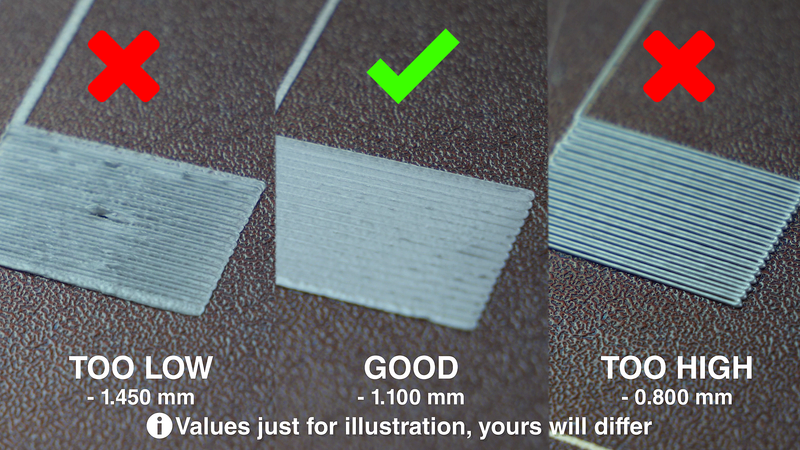 The first layer calibration process is the same for Original Prusa i3 MK2/S and MK3. Just keep in mind that you must always print on the PEI surface. Never print directly on the heatbed without the PEI sheet or Steel sheet. Launch the calibration through the LCD Menu - Calibration - First layer cal. Starting with firmware version 3.1.0. this process is fully integrated into the firmware. An on-screen prompt will ask, whether the printer is loaded with PLA. Check the filament and select [yes]. Your printer will automatically preheat for PLA and start printing. Once the print starts, a new menu Adjusting Z appears, giving you an option to tweak the height of the nozzle by tiny increments. The aim is to lower the value until the extruded plastic is sticking nicely to the heated bed. Extruded plastic should be slightly squished. Repeat this process if the extruded line did not stick to the heated bed. You can compare your final result with the photo below. In practice, your Live adjust Z value can be anything between -0.100 and -2.000 mm. If you need to offset this value a lot to make the print stick (e.g. -2.500), you can lower the PINDA probe a tiny bit and repeat the First layer calibration. This is how the profile of the extruded filament on the print surface should look. Your Live adjust Z value will differ. If you still struggle with the first layer calibration, check out the "Guide for a new user" video. The process is the same on both MK2/S and MK3. Generally, the first layer calibration should be performed every time there is a major change in the assembly. Live adjust Z should be performed only if you made some minor tweaks. You can enter this menu ONLY while printing by pressing the Knob - Live adjust Z. Then, you can adjust the height of the nozzle. Also, you should run these calibrations if you move the print to a different location. Launch the calibration through the LCD Menu - SD card - start V2 calibration print (this G-code can also be found on our driver's page). Make sure to use only PLA for this print. Once the print starts, press the Knob and select Live adjust Z to open the Live adjusting Z menu, where you can tweak the height of the nozzle. The aim is to continue decreasing the value until the extruded plastic is sticking nicely to the heated bed. Extruded plastic should be slightly squished.